Audi Creve Coeur is a full service Audi dealership located just west of downtown St Louis and is proud to serve customers in St Louis, Chesterfield, Ellisville, Manchester, Creve Coeur, Missouri & Illinois, located at 11830 Olive Blvd. Visit or contact our Creve Coeur area Audi Dealership today and allow us to demonstrate our commitment to excellence! In addition to providing new Audi cars and SUVs for sale, Certified Pre-Owned Audi and luxury pre-owned cars for sale, we also provide auto repair services that are associated with Audi ownership including Audi service, Audi parts and Audi finance to all of our customers. At Audi Creve Coeur, we take pride in our superior customer service and nothing is more important to us than providing our customers with the best service in Creve Coeur, St. Charles, Chesterfield, and other cities surrounding St. Louis, Missouri and Illinois. We have spent years building our reputation as being a leading luxury car dealer in the state of Missouri! Our Audi Creve Coeur Service Techs and Advisors will always clearly explain service requirements and charges. Your new Audi will be delivered in showroom condition and after each service; it will be washed and vacuumed. Contact us today or visit our location near St Louis and experience the Plaza difference. Audi Creve Coeur is the premier Audi dealer serving Creve Coeur and St Louis, Missouri. Our dealership is in the ideal location for those looking for a new Audi in Chesterfield, Manchester, Kansas City, Springfield and St. Louis, MO. Whether you are looking for an A3, A4, A5, A6, A7, A8, Q3, Q5, Q7 or TT, you will find just what you are looking for in our inventory. We are also the best place to find a new S3, S4, S5, S6, S8 or R8 if you are looking for any Audi performance model. If you can't find what you are looking for in our inventory, use our CarFinder tool and our experience sales team will find the perfect Audi for you with everything you want. You can also order your next car or SUV online and have it delivered to you using our PushStart online buying tool. Shop our new inventory today or take advantage of our current offers going on now at Audi Creve Coeur. If you are looking for luxury used cars in St Louis, Audi Creve Coeur has an extensive collection of Pre-Owned and Certified Pre-Owned Audi vehicles. Cars that receive the Certified Pre-Owned designation are some of the highest quality used cars in St Louis available from the top brands that you are looking for. If you are looking for a used car, truck or SUV in St Louis, Creve Coeur Manchester, St Charles, Chesterfield, and near Illinois, browse our used car inventory to find your next quality pre-owned used vehicle on our website, or visit us in person. You can also take advantage of our other online tools like our online credit application to pre-qualify for financing, our car payment calculator and more. Experience the difference at Plaza Audi Creve Coeur. The next best thing to owning a new car or SUV from Audi Creve Coeur is owning a Certified Pre-Owned Audi. When you own an Audi Certified Pre-Owned vehicle, you own a vehicle that passed a 300+ point dealer inspection process and comes with a 6-year/100k limited warranty and competitive rates. Audi Creve Coeur has a vast selection of CPO Audi vehicles to choose from, so you are sure to find what you are looking for. View our Certified Pre-Owned inventory to find your next luxury pre-owned car or SUV or click here to learn more about what it takes to wear the Certified Audi badge. To learn more about Audi CPO vehicles, visit your can also visit www.AudiUSA.com. Audi Creve Coeur is pleased to offer our customers with several online tools to help make financing your next vehicle as convenient as possible. We are not a far drive from St Louis, Creve Coeur, Kansas City, Springfield, Chesterfield, Manchester or Illinois and will provide an experience second to none. Check out our online trade in value calculator, car payment calculator and online credit application; the perfect tool set for determining your ideal budget for your new luxury car, crossover or SUV. All of these and more can be found on our Audi website. We also offer a large selection of lease and finance specials. We update our specials often so be sure to check back frequently! Visit our finance center for more car loan and lease information. If you are looking to trade-in your current vehicle or just sell an extra car or SUV for cash, sell your used car in St Louis to Audi Creve Coeur. Our easy online form can begin the appraisal process before you enter the dealership, saving you time and frustration. Schedule your appraisal today or contact us for more information. Audi Creve Coeur has service and parts departments that are second-to-none in the St. Louis area. Our industry certified experts are seasoned in diagnosing any problem your new Audi or used car may be experiencing, and will get you back on the road as soon as possible. If you need to schedule a service appointment, you can use our online service scheduler. If you are in the market for a new Audi or a used car in the greater Creve Coeur area, we hope to see you soon. We have spent years building our reputation as being a leading Audi dealer in the state of Missouri. Audi Creve Coeur is fully-equipped with an auto body repair shop is ready to serve our clients with professional collision repair in south Missouri. Our goal is to work closely with insurance companies to make sure that your vehicle is taken care of and returned to you in a like-new state that you are happy with. From a paint shop that works to match all colors and trims to the OEM parts that we use, our collision center will ensure that you get a factory quality finish when repairing your vehicle. Click here to schedule your collision center appointment on our Audi website or to learn more. 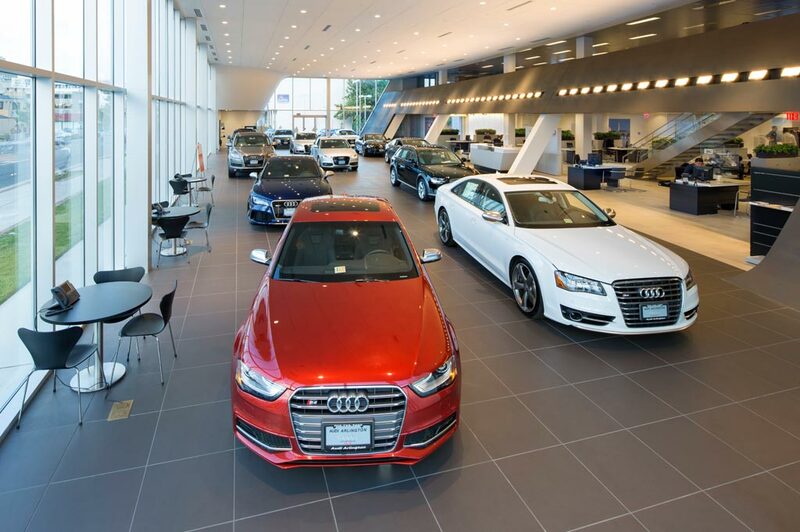 Audi Creve Coeur in Creve Coeur, MO treats the needs of each individual customer with paramount concern. We know that you have high expectations, and as a car dealer we enjoy the challenge of meeting and exceeding those standards each and every time. Allow us to demonstrate our commitment to excellence! Our experienced sales staff is eager to share its knowledge and enthusiasm with you. We encourage you to browse our online inventory, schedule a test drive and investigate financing options. You can also request more information about a vehicle using our online form or by calling (314) 266-1040.